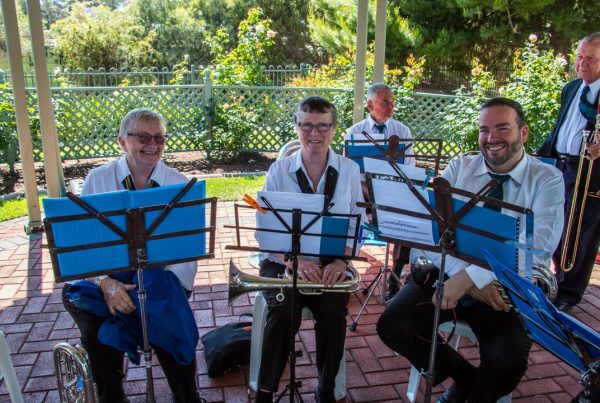 CCB traveled up the freeway on a pleasant sunny Sunday afternoon to perform in the picturesque township of Balhannah/Oakbank located in the Adelaide Hills. 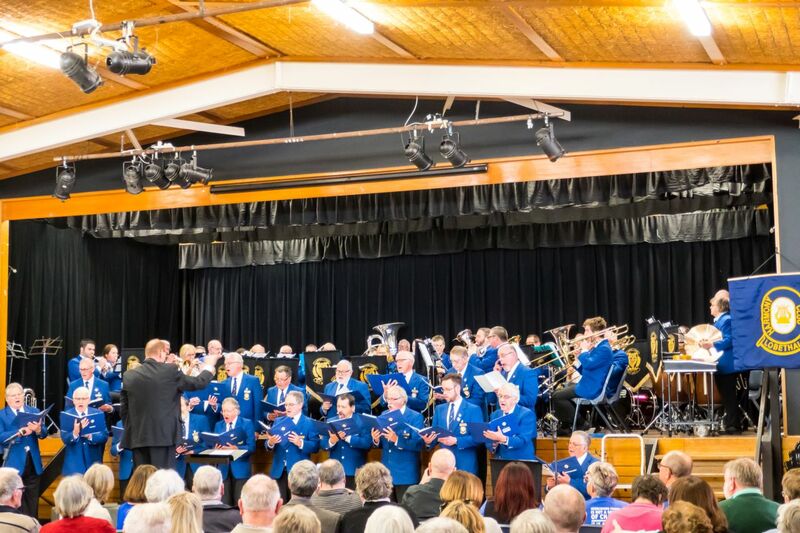 Joining forces with the local Lobethal Harmony Club (Musical Director Gerry Roberts) and the Balhannah Uniting Church (Minister Geoff Hurst) putting on a Charity concert to raise funds and awareness for ‘Compassion Australia’. The afternoons proceedings were under the watchful eye of our very own, well researched and executed compere Sue Smith who managed to keep us on track and well and truly entertained throughout the afternoon. 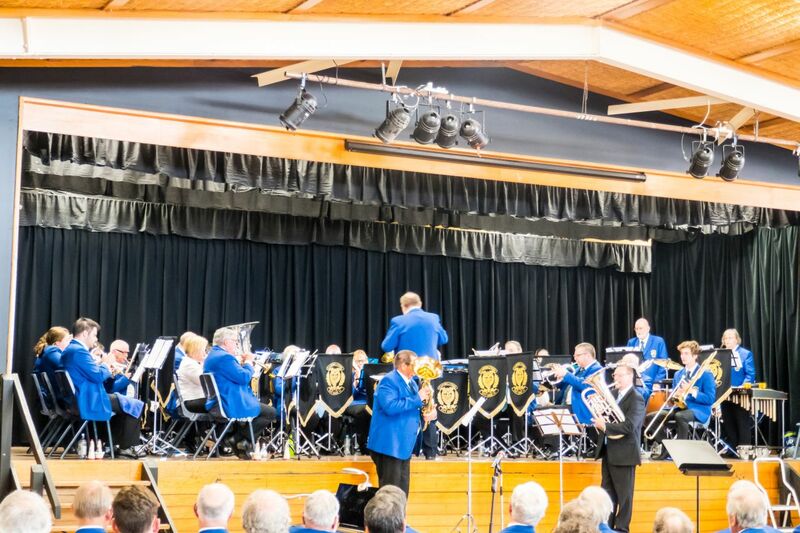 The band commenced proceedings with the stirring march from the pen of Goff Richards, ‘Barnard Castle’. This is a march that the band has enjoyed performing and particularly after having success using it at the recent State Band Championships (Did we mention that we came 2nd!!!). There was only ever going to be one bigger number to top this crowd pleasing opener and that was the overture to Ben Hur, from the 1959 film with music from the Hungarian composer, Miklos Rozsa. 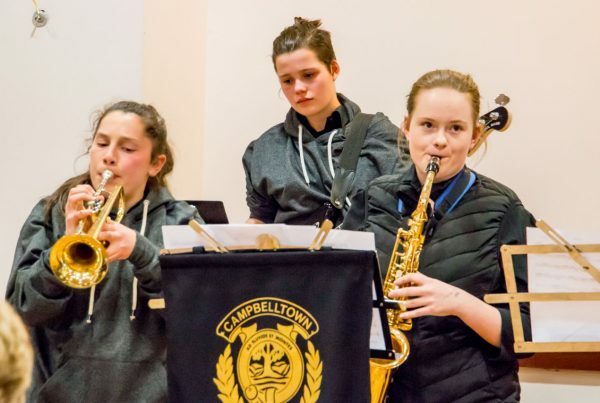 The band relaxed the atmosphere for the final two numbers in this opening bracket with the beautiful Robbie Williams ballad ‘Angels’ and the classic jazz standard ‘Body and Soul’ featuring our own jazz standard, Mr Gary Boland. 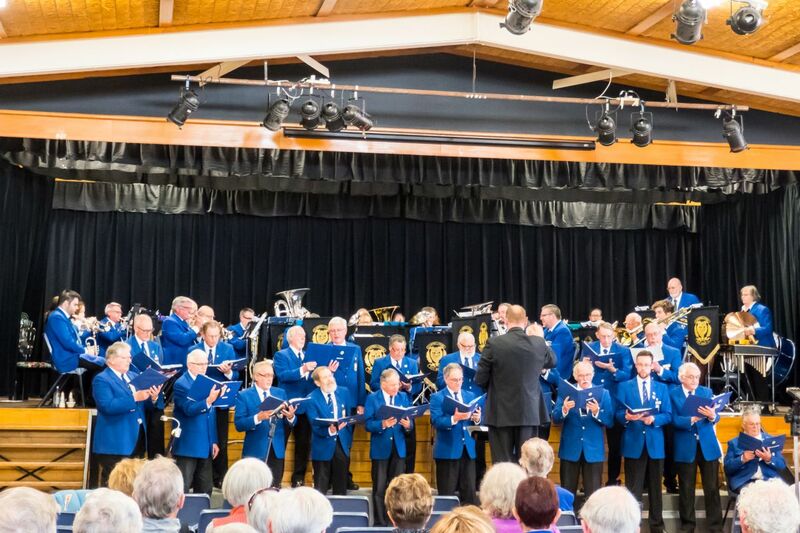 It was now time for our special guest’s the Lobethal Harmony Club to take centre stage and bring us their opening bracket of numbers. LHC had just celebrated their 145th anniversary, so everyone was eagerly awaiting to see what they would present. 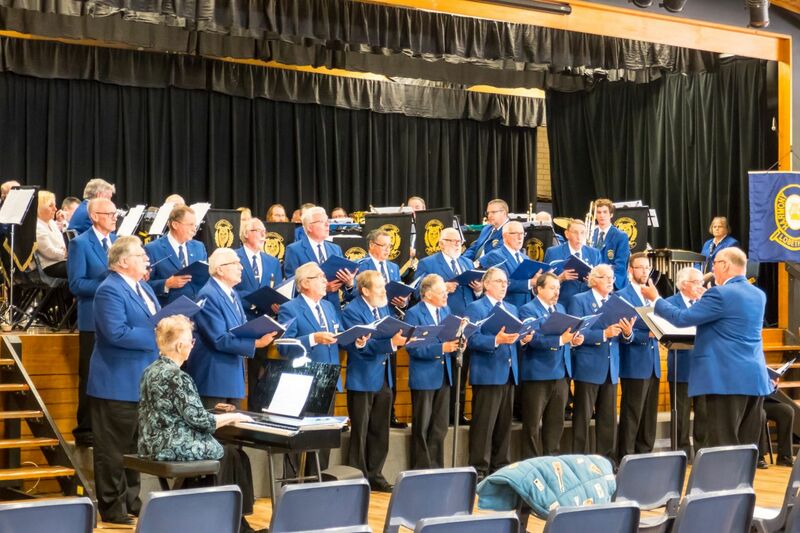 They started off with a Russian folk song ‘Casatschok’ (did that trouble our compere – NO), then an Australian folk song ‘A Billowing Sail’ written by Rosemary Nairn who was for a time the conductor of LHC. Chess is a musical with music by Benny Andersson and Björn Ulvaeus of the pop group ABBA, lyrics by Tim Rice, and a book by Richard Nelson, the choir presented the beautiful Anthem from this musical. Moving away from the 1980’s back to the 1600s with the traditional hymn from Isaace Watts “Morte Christe’ (When I Survey The Wondrous Cross) concluding this well presented set of songs. Back for more brass with the fast-paced ‘Breezin Down Broadway’ again from the pen of Goff Richards, followed by the haunting sounds of Ennio Morricone’s ‘The Mission’, whilst written for the Oboe, this rendition by Julie Dorey on cornet makes the hairs on the back of your neck stand up. After that emotional roller-coaster, normality had to be restored before the interval and everyone devoured the mountain of scones and cream on offer. 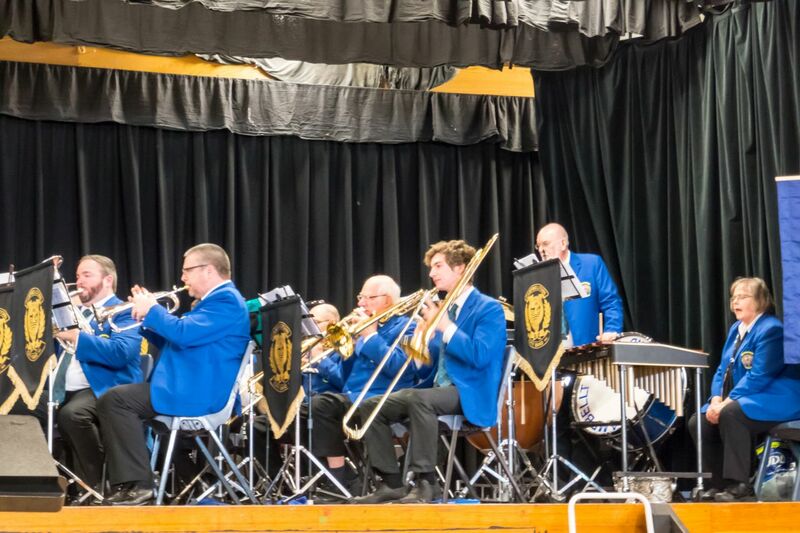 A bolero-mambo seemed to fit the bill, featuring our President Mr Wayne Jackson on cornet with ‘Sway’ written by Mexican composer Luis Demetrio, who sold the rights to fellow songwriter Pablo Beltrán Ruiz for just £250. The mountain of scones looked like ‘Mission Impossible’ but there wasn’t much left at the end of the interval. The band returned to the stage (a little heavier) belting out the well-known 5/8 rhythm and big band sounds composed by Argentinian Lalo Schfrin, the ‘Theme from Mission Impossible’. 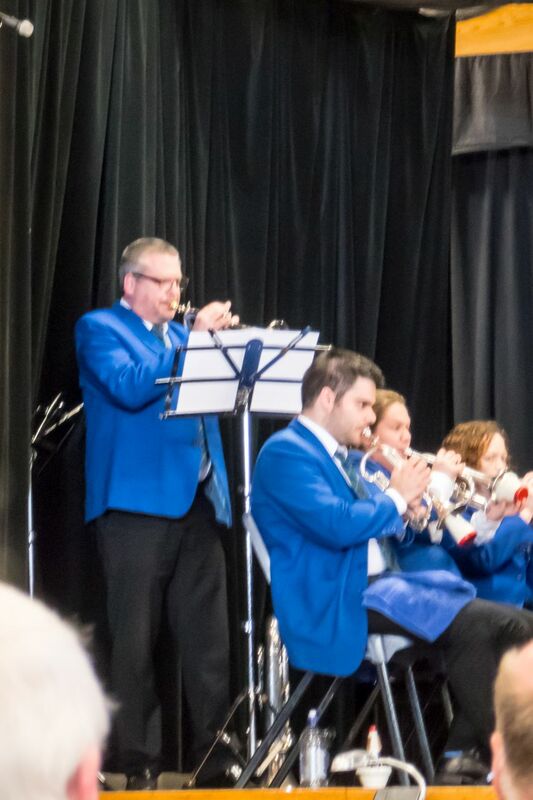 The next number featured several members of the band: Adam Little – Flugel, Steve Packer – Euphonium, Julie Dorey – Cornet & Jordan Belpario – Soprano, with the beautiful Bette Midler classic ‘Wind Beneath My Wings’. The band has used the next number a few times this year, each time proving to be the highlight with the audience and today was no exception. ‘Blue Moon” is a classic popular song written by Richard Rodgers and Lorenz Hart in 1934, and has become a standard ballad and much loved by band and listener alike. 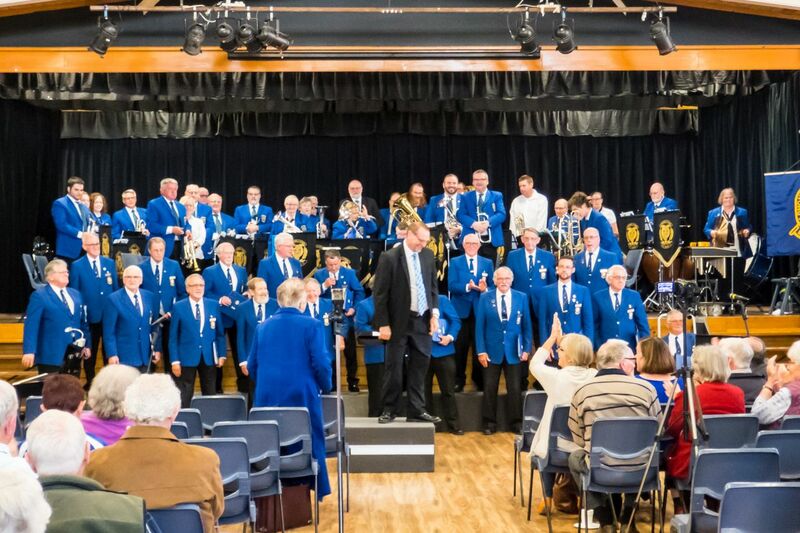 LHC returned to the stage for their second contribution for the afternoon commencing with the sentimental ‘Kentucky Babe’ before launching into the Cole Porter number ‘Don’t Fence Me In’. Although it was one of the most popular songs of its time, Porter claimed it was his least favourite of his compositions – well we enjoyed it. ‘Click Go The Shears’ is a well-known Australian traditional, or is it? According to the American composer (?) Norman Luboff, who claims that he wrote it. Either way LHC had a lot of fun presenting it. LHC’s final number was ‘I Love a Piano’ a popular song with words and music by Irving Berlin. It was introduced in the Broadway musical revue Stop! Look! Listen! In 1915 -Irving Berlin always regarded the song as one of his best efforts. It was time to turn our focus onto the reason we were here, and hear about the great work that Compassion Australia are doing. Compassion is a Christian international holistic child development organisation. Through their Child Sponsorship Programs, more than 1.8 million children are currently being released from poverty in Jesus’ name. Worldwide, 385 million children live in extreme poverty. Poverty robs children of their basic rights to learn, play and grow. In its ugliest form, poverty can lead to exploitation, child labour and even death. It’s unacceptable. 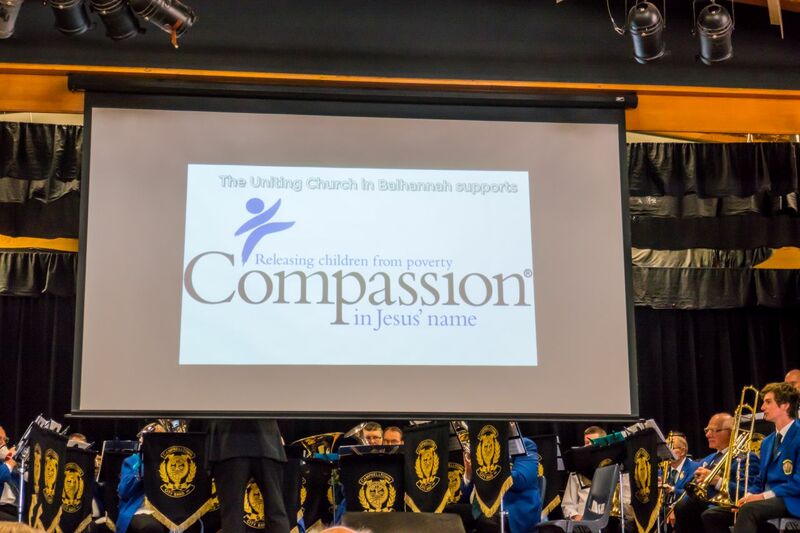 Book-ending the informative insights and moving video presentation from Compassions David Helyard the band performed two appropriately titled numbers, the first featuring Mr Adam Little on his Flugel horn with ‘A Wonderful World’ complete with pictures of some of the children Compassion supports. 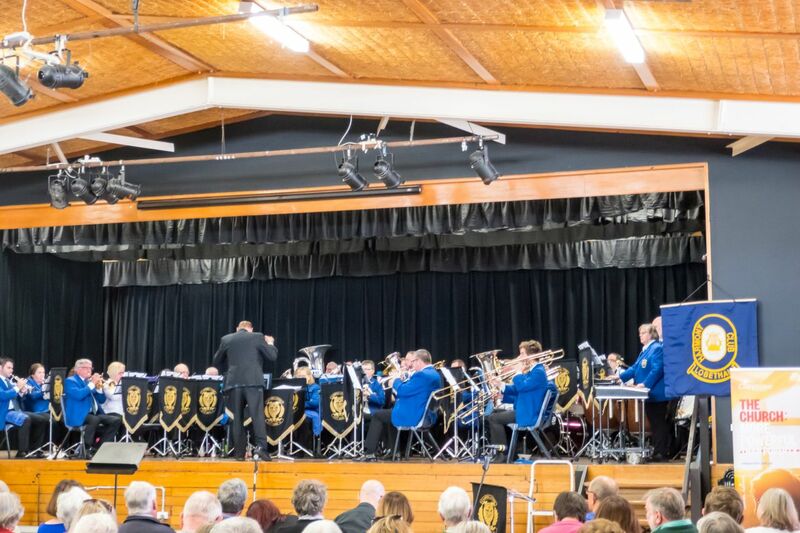 The 2nd piece brought two musical directors (Peter Smith – CCB and Steve Packer – MCB) together along with their euphoniums to perform the John Denver classic ‘Perhaps Love’. Rounding off the afternoon was the ever enjoyable, toe-tapping, high energy rendition of Michael Jacksons (no relation to our own Jackson 2) ‘Thriller’. What, no encore I hear you sigh! Well no we couldn’t escape into the sun-soaked surrounds just yet, otherwise there would have been riots in dem hills. The band struck up the John Williams ‘Midway March’ thinking that would be enough. Wrong, they wanted more and something bigger – could we do it? 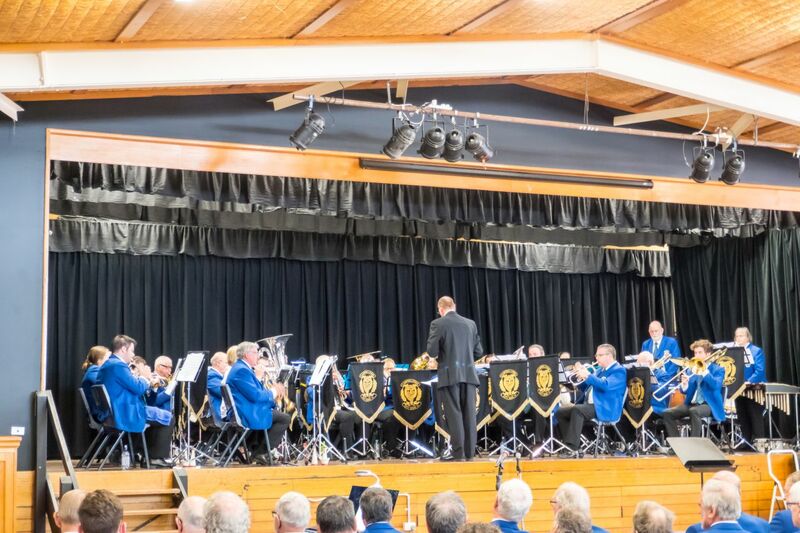 Well we had just one more up our sleeves, inviting LHC to come and join the band, our MD marshalled the now 70 strong musicians with the rousing anthem ‘Men Of Harlech’, that did the trick with a standing ovation by this appreciative audience. 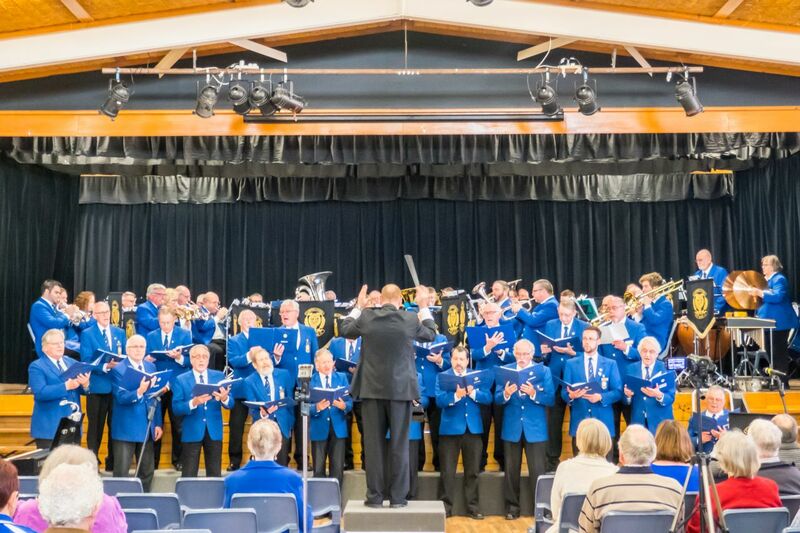 Another successful CCB concert drew to a close, everyone was well satisfied with a musical smorgasbord and did I mention those fantastic scones. But the best part of the afternoon was raising over $3000 and seeing several child sponsorships being taken up. 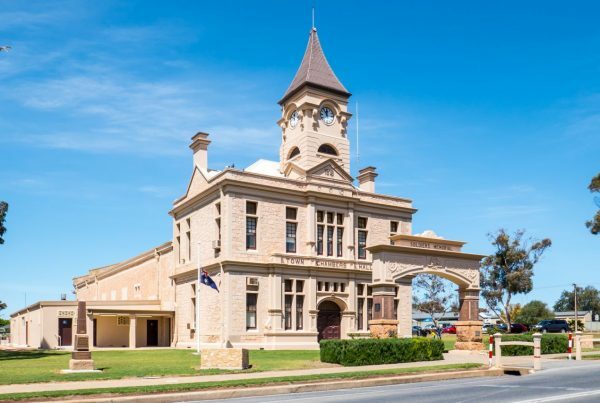 Our thanks to the Balhannah Uniting Church for giving us the opportunity to be part of this worthwhile venture.